The three star Hotel 007, opened in January 2009, is situated in a brand new building in the center of Sofia. 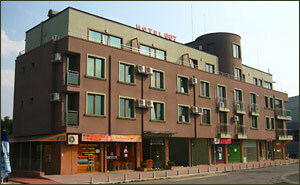 The hotel offers a combination of high quality service and comfort. The hotel is situated 300 meters from the new sport hall “Arena Armeets Sofia”, 3 kilometers from Sofia Airport and 2 kilometers from the ideal center of the city. The hotel has 10 double rooms, 2 luxury rooms and 2 apartments. Each room is decorated with luxurious furniture and impress with coziness and comfort, which makes Hotel 007 an ideal choice for a city type accommodation. Hotel 007 is a 4 storey building and has an elevator.